HAMLET — It’s not often the conductor or choir director takes the limelight from the students on stage. After all, the best performances are the ones in which the conductor, much like an umpire in baseball, is seen but not heard. 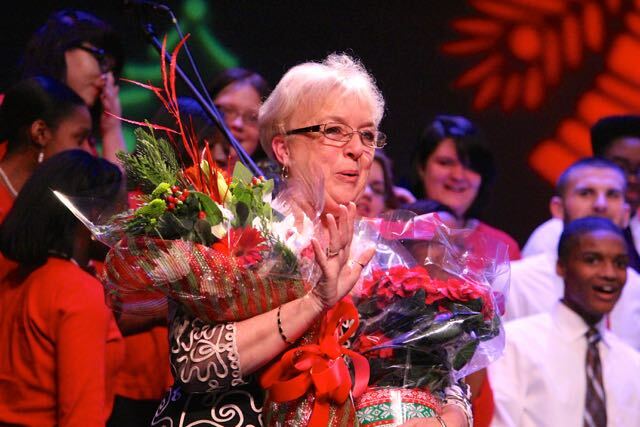 Debbie Price was given flowers and a special version of “He Ain’t Heavy, He’s My Brother,” by her students to send her into retirement, which begins Friday at about 3 p.m. 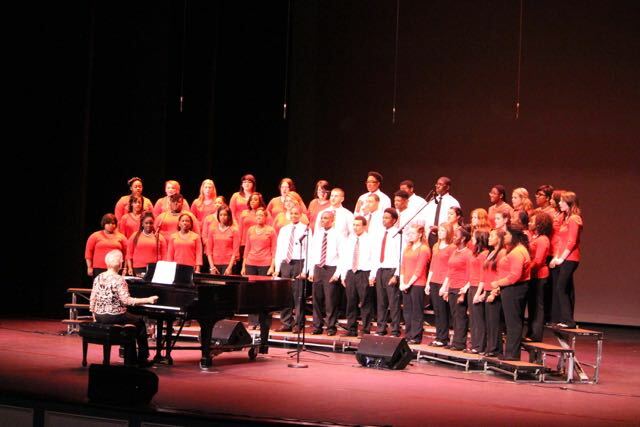 But there was no doubt that Tuesday night inside the Robert L. and Elizabeth S. Cole Auditorium at Richmond Community College belonged to Debbie Price. 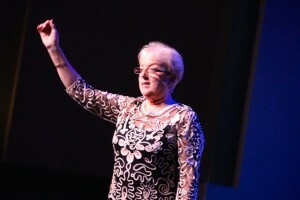 Price is set to retire on Friday after 40 years in education. 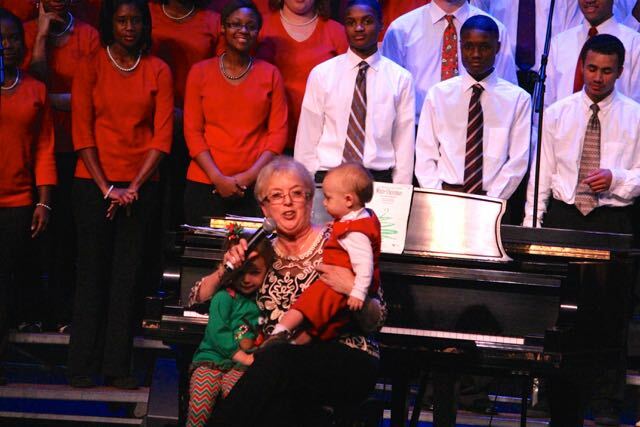 She has been the choir director at Richmond Senior High School since 1997. Before that, she was at Rockingham Junior High School for 18 years and, for four years, at Ashley Chapel Elementary School. During the numbers, Price danced in her seat from the piano bench, her hands in the air as she guided the Richmond Senior High School Choral Music Department, which included students from the Ninth Grade Academy. She snapped her fingers with the situation called for. 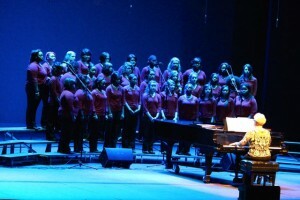 Led the crowd in a group performance of “Silent Night.” Smiled and gave the students an encouraging nod even when a note was missed or a word forgotten. After “White Christmas,” students presented Price with a bouquet of flowers and serenaded her with a special version of “He Ain’t Heavy, He’s My Brother.” The choir substituted “teacher” for “brother.” The lyrics are inspired by a story from a Boys Town orphanage in the days of post-World War I. They attempt to show how meaningful it is to care about someone, and to have someone care about you. There is no doubt, however, that Price is ready for retirement. In fact, she had the two primary motivating factors brought up on stage just before “White Christmas.” Granddaughter Gia Brenmartin, 3, and brother Cooper, 1, live an hour away. “They’re here because they love music,” Price said of those in the audience. “Yes,” Price said, wiping away a tear or two and making a minor fuss about her messed up makeup. Short of vacations and summer breaks, Monday morning will be Price’s first free weekday in decades. Her freedom will be a permanent one. What to do? “After my third cup of coffee, I’ll decide,” Price said. Baritone/Bass: Dadriene Davis, Dante Davis, Blake Dawkins, Houston Griffin, Juwan Lockhart. and she has touched so many. I would like to say how disappointed I am in the School system and I hope they are disappointed with themselves as well. Last night they should have taken the opportunity to show some well deserved appreciation to Mrs. Price, but they failed! 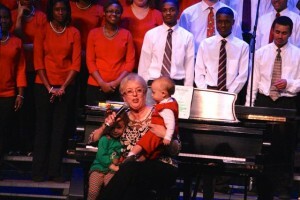 I am thankful to her students who stepped up and took the time to make the event a special one for her and her family. I am so glad I was there to see Debbie’s last performance. As usual, her kids were fantastic. Thank you for all you have done to better the lives of Richmond County kids. You will be missed!